Based on reviews from 3 experts and 77 users. 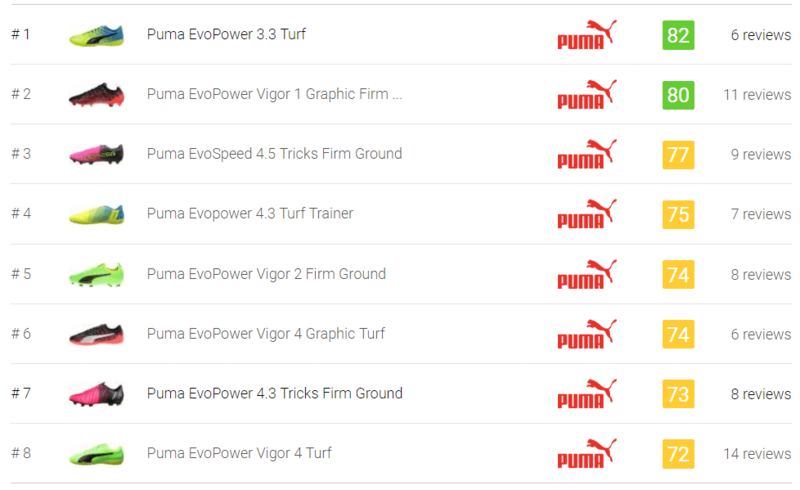 Learn how our rankings work or see our guide to Puma EvoPower football boots. Updated Apr 2019. After years of extensive research involving foot anatomy, Puma concluded that the level of shot power is a result of allowing the foot to flex and the toes to curl naturally. Thus, the Puma evoPOWER football boot was designed to provide absolute foot freedom with the purpose of enhancing striking power. It is one of the Puma football boots that are packed with ingenious innovations. Wearing a Puma evoPOWER football, you will realize that every piece of technology serves its purpose. They all work well together to create an entirely new and exciting experience compared to any other football boot on the market. The Adap-Lite upper is a Japanese synthetic material that is soft and has a smooth texture. The first time it was used on a football shoe was on the 2014 edition of the Puma evoPOWER football boot. It expands and follows the contours of the foot vertically but not horizontally. By doing so, the shoe allows maximum freedom of movement while still maintaining support. Because of this Puma-exclusive technology, the upper can flex, bend, and stretch in the direction of the foot mimicking its natural flexibility when driving a ball. As a result, the Puma evoPOWER football boot keeps its shape and stability when making cutting movements. On the original Puma evoPOWER football boot, the Accu-Foam comes in 19 rectangular chunks of foam in the upper and two on the tongue. They are positioned far enough from each other to allow the upper to follow the shape of the foot comfortably. This technology offers two purposes for a Puma evoPOWER football boot. One, it acts like a rubber that rebounds when you strike a shot. Two, it cushions the foot when controlling the ball in close situations. The EverFit Cage is a lightweight synthetic material that is usually found on the inside of a football boot such as the Puma evoSPEED silo. The EverFit Cage Ext is seen on the outside of a Puma evoPOWER football boot to reinforce the upper material. It is very durable and ensures that the football cleat keeps its shape despite continued use. The Gradual Stability Frame or GSF is a spine bar that runs across the midfoot of the soleplate. It is stiff in the heel and gradually loosens as it approaches the midfoot area. The GSF is very flexible underneath the toe bend of the Puma evoPOWER football boot. It reinforces stability and allows the soleplate to snap back to its original shape quickly. Originally found on the Puma evoSPEED football boots, the 3D GripTex Print was introduced to the upper of the Puma evoPOWER 1.3 in 2016. It is designed to enhance ball grip and control in both wet and dry conditions. It is similar to the Non Stop Grip (NSG) technology found in Adidas football boots as well as the All Conditions Control (ACC) technology found in Nike football boots. The GripTex technology is also placed on the inside of the Puma evoPOWER Vigor 1 to avoid any in-shoe slippage. Famous for their limited-edition football boots, Puma released a number of football boots in collaboration with fashion brands, watchmakers, car manufacturers, and their endorsers. Often, these unique Puma evoPOWER football boots come in eye-catching colorways, but it is interesting to note that the technologies used are similar to the regular variations. This German shoe brand has been known for their Tricks Collection, such as the Puma evoPOWER Tricks 2014 World Cup Boots and the Puma evoPOWER 1 MB45 football boots. They also have a Tricks edition football boots for the evoSPEED series such as the Puma EvoSpeed 5.5 Tricks Firm Ground. The general silhouette of this shoe is taken from the original Puma evoPOWER football boot. What is unique about this pair is that the left shoe fades from black to pink while the right shoe fades from black to yellow. Puma released only 94 pairs of the ultra-limited-edition Puma evoPOWER 1.3 2016 Celebration Pack. Tech-wise, this shoe is the same as the standard third-generation Puma evoPOWER football boot. The design is predominantly black and silver with gold details. The right shoe has the Safety Yellow Form Stripe on the lateral side, while the left shoe has the Pink Glo Form Stripe on the lateral side as well. It has a slightly darker vibe than its evoSPEED counterpart. The accent colors can also be found at the tip of some of the studs for the firm ground (FG) variation of this football boot. The 2016 Celebration Pack, which also features the special edition Puma evoSPEED SL II, was produced exclusively to celebrate the winners of the 2016 Euro and Copa America Centenario tournaments. Launched with only 400 pairs available worldwide, the Puma evoPOWER MB45 has the exact same modifications found on the Puma evoPOWER 1 that Mario Balotelli himself wears. The color design pays homage to the Italian flag. The famous Genghis Khan quote, “I am the punishment of God. If you had not committed great sins, God would not have sent a punishment like me upon you” can be found on the lateral side of this limited-edition Puma evoPOWER football boot. On the medial side, the three words "Professionalism, Endeavour, Humility" can be seen. With Puma releasing unique football boots for Mario Balotelli and Marco Reus, it does not come as a surprise when they released a signature edition Puma evoPOWER football boot for Spanish midfielder Cesc Fabregas. The Puma evoPOWER 1 C4 was released with only 400 pairs worldwide. In an attempt to stick to their famous Tricks theme, this Puma evoPOWER football boot also comes in a Chelsea-esque colors: blue and white. The shiny clear coat “C4” and “Fabregas” on the outstep are visible against the matte-finished upper. Aside from the matte finish on the upper, the only difference from the regular variation Puma evoPOWER 1 is the slightly stiffer soleplate because of the added material underneath the insole. Taking inspiration from Japan’s mythical creatures, the Puma evoPOWER 1.2 Dragon pack was designed with strength and accuracy in mind. Its colorway was officially listed as High Risk Red-Sea Pine. This Puma evoPOWER football boot’s artistic look is finished with printed dragon scales on the heel. Another pair of limited edition Puma evoPOWER football boots is the Puma evoPOWER 1.2 Camo in the striking Peacoat-Bright Plasmapink colorway. The basic tonal shading and orange triangular patterns create a 3D optical illusion to keep the distinctive features of the boot concealed until the official colorway is launched. There were only 580 pairs produced for this football boot. Initially launched in the Gecko-Black-Safety Yellow colorway, this 2017 Puma evoPOWER football boot was released in a stunning blackout edition. What makes it special is that this football boot comes in synthetic and K-leather versions. It boasts an all-black look with no colorful details. Another impressive and visually striking Puma evoPOWER football boot comes in the form of the Puma evoPOWER Vigor 3D. The multi-dimensional upper has an iridescent effect that immediately draws attention and creates a dramatic look to the boot. The actual shade of the upper is dark navy, but depending on how the lighting, shades of green and purple can be seen. What is the similarity between the Puma evoPower cleats and Nike Hypervenom football boots? The Puma evoPOWER 1.2 has a similar honeycomb-like structure as the Nike Hypervenom football boots. What makes the Puma evoPOWER football boots different from the Puma evoSPEED football boots? The Puma evoPOWER football boots are built for players who want an added boost in control, stability, balance, accuracy, and power; while the lightweight Puma evoSPEED football boots are designed with speed and flexibility as the goal. Which foot types are best for the Puma evoPOWER football boots? With its wide last, the Puma evoPOWER football boots are suitable for players with normal to slightly wide feet. Who are the endorsers of the Puma evoPOWER football boots? Majority of the high-profile football endorsers of Puma wear the evoPOWER football boots. They are Marco Reus, Olivier Giroud, Sergio Agüero, Cesc Fabregas, Gianluigi Buffon, and Mario Balotelli. What does the Tricks collection represent? The Puma Tricks is the brand’s key product element in their “The Nature of Believing” marketing campaign. It represents the wearer’s unshakable confidence when donning a contrasting pair of Puma Tricks football boots. This collection of two-toned football boots is best for players who dare to be different and want to stand out on the pitch. What does the “C4” branding on the signature Puma evoPOWER football boot for Cesc Fabregas mean? The C in C4 stands for the initial of Cesc first name and 4 stands for his squad number. It is also interesting to note that C4 is a type of explosive. Thus, the universal explosive logo is cleverly placed at the back of the shoe and on the string bag that comes with the signature edition Puma evoPOWER football boot.